ASHLAND – Louis A. Travaglini, 88, longtime resident of Ashland passed away Thursday Apr. 4, 2019 at his home surrounded by family. Born in Framingham, he was the son of the late Ernesto and Elvira (Rinaldi) Travaglini. He was the husband of Priscilla (Japp) Travaglini for 65 years. Travaglini was a self employed master electrician from 1968 thru 1997 until becoming the electrical inspector for the Town of Ashland, retiring in December of 2018. Lou served his country honorably with the Navy during the Korean War from 1951-1954 on the USS Laning. 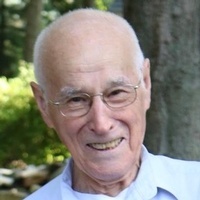 In addition to his wife; he is survived by five children; Marie P. Germain, Louis A. Travaglini Jr. and his wife Teri Rutherford; Karen L. Ferraro and her husband Vincent; Nancy A Flannery and her husband Michael; and Jo-Ann P. Ramm and her husband Kurt; nine grandchildren, and twelve great grandchildren. A funeral mass will be celebrated Wed. April 10 at 8 a.m. in St. Cecilia’s Parish, 54 Esty Street in Ashland.